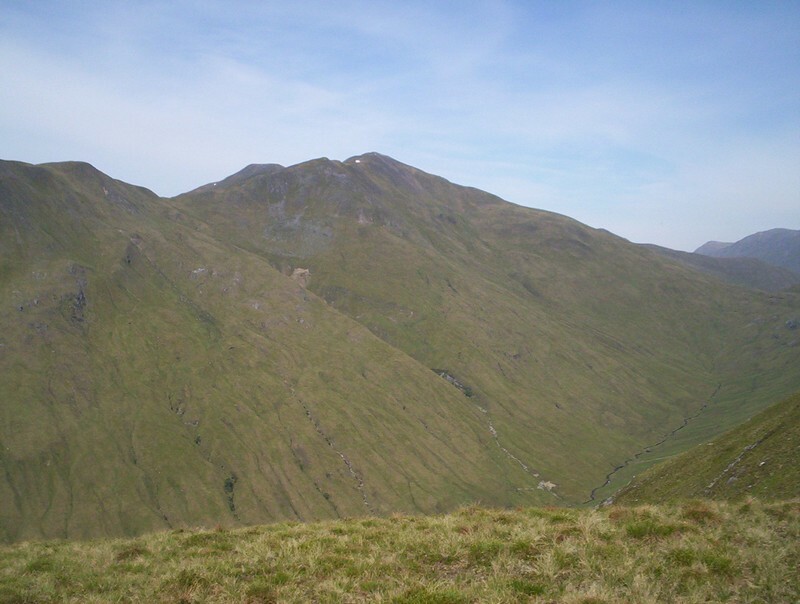 For my first walk in Glen Shiel I decided to climb the Corbett of Am Bathach and the four Munros, Ciste Dhubh, Aonach Meadhoin, Sgurr a' Bhealaich Dheirg and Saileag. Looking at the timings in various guide books it looked possible to do these in a fairly long day. What I hadn't reckoned with was the heat of early June 2009 which slowed me down considerably. For the first time in years I ended a walk with blisters caused, I'm sure, by the heat. 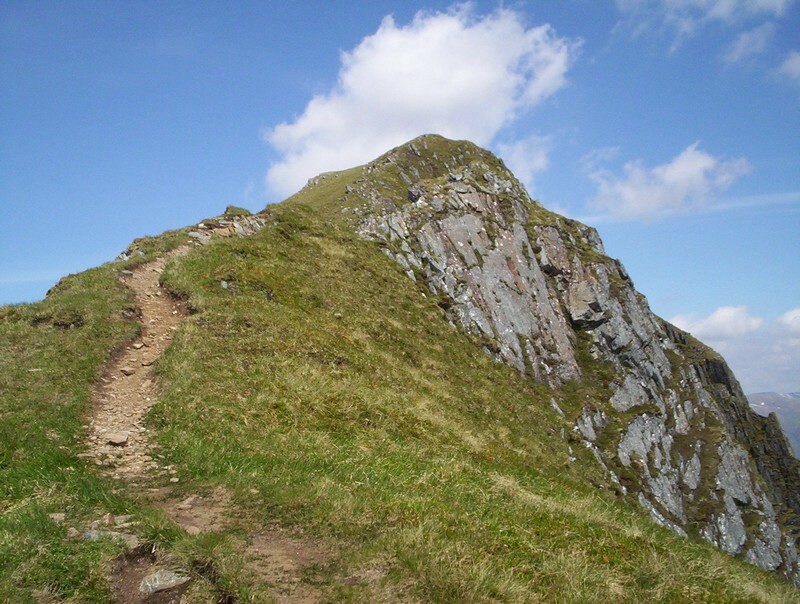 In the finish I terminated my ambition after Aonach Meadhoin in order to reach the Cluanie Inn for my evening meal. Starting the walk near the small forest, just east of the Cluanie Inn, at 09.20, the summit of Am Bathach was reached at 10.45 at the time I expected. 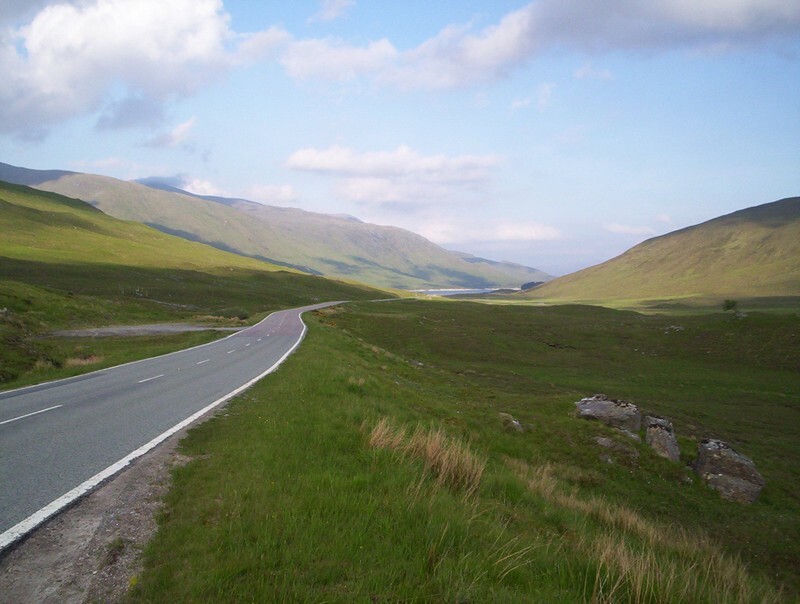 By 11.20 I was at the Bealach Choinich leaving there at 11.35 after a break. 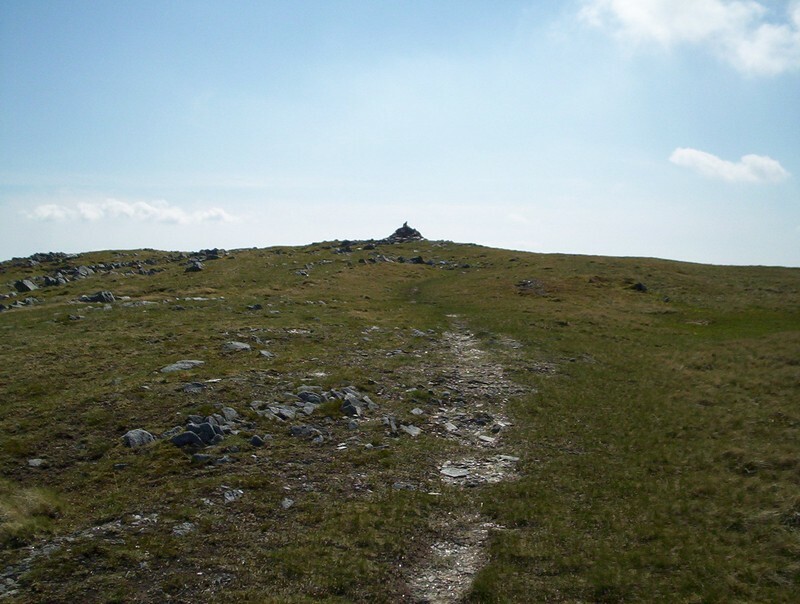 The climb to the summit of Ciste Dhubh lasted until 13.05 much longer than expected. 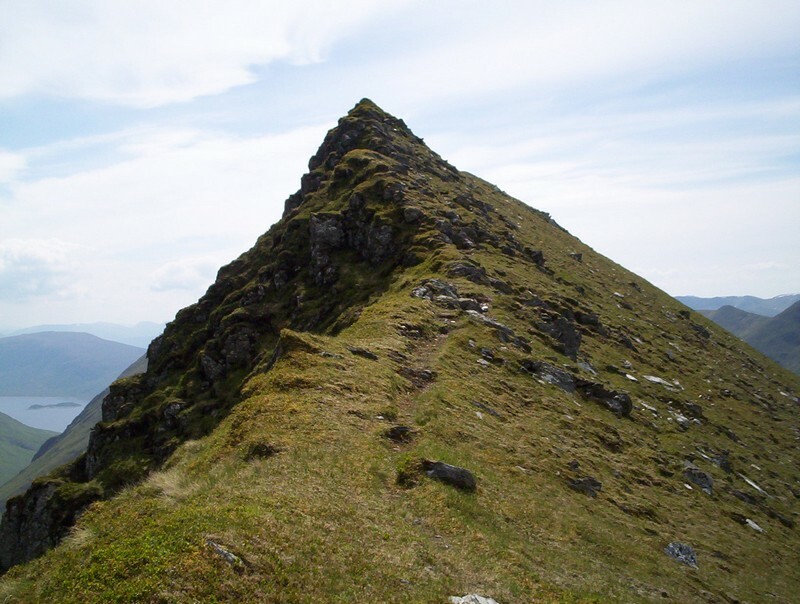 After a longer than intended break I left the summit of Ciste Dhubh at 13.35. 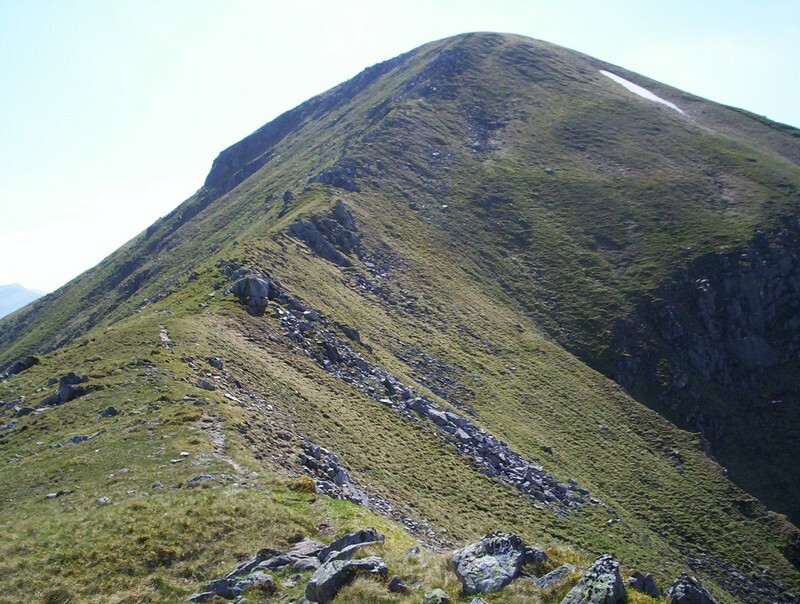 The guide book suggested a time of about 1 hour 45 minutes to reach Aonach Meadhoin. It took me an hour to return to the Bealach and it wasn't until 16.10 that I was on the summit of Aonach Meadhoin. My progress in the heat was far slower than I expected. By now I was running about an hour and a half later than intended, so after another rest I descended the long and steep south ridge to arrive back at the main road at 18.30. 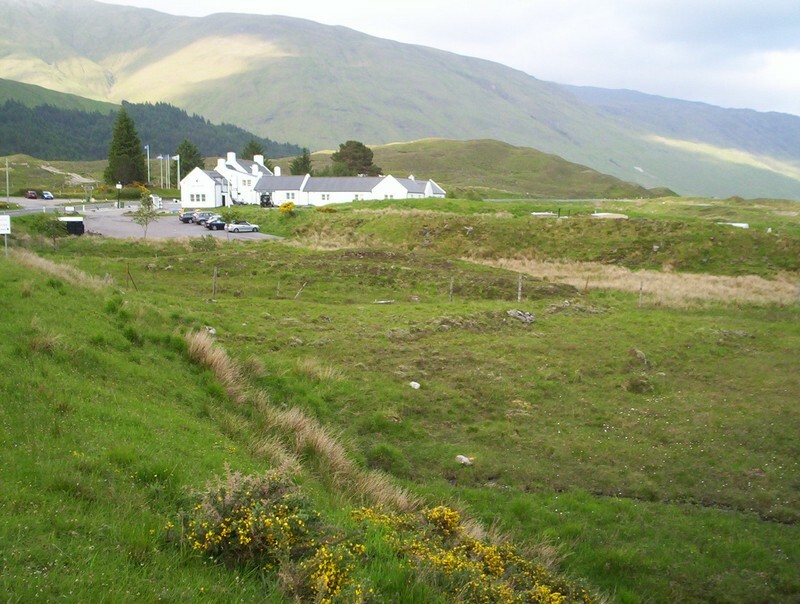 A brisk walk along the A87 found me back at the Cluanie Inn at 19.00 ready for a shower! 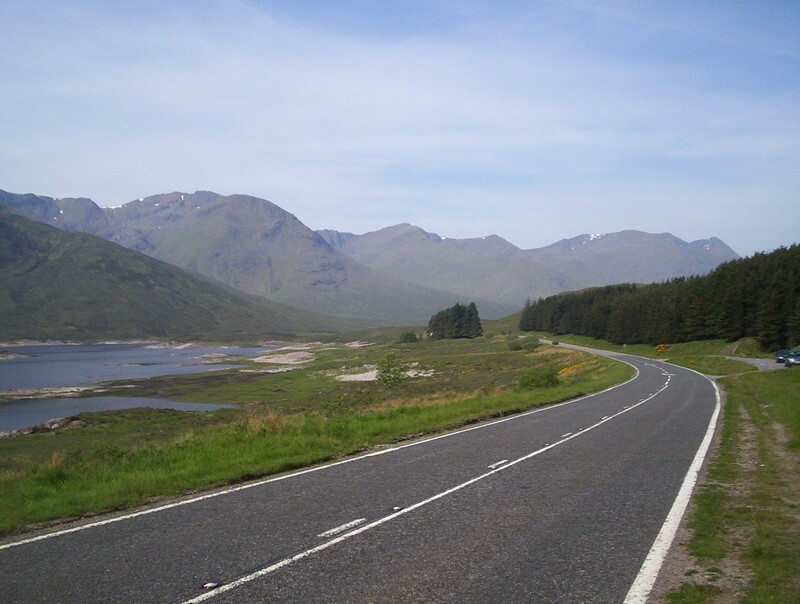 Seen from the A87 just east of the Cluanie Inn, Ciste Dhubh's pointed summit can be seen in the distance with Am Bathach's long ridge in the centre. 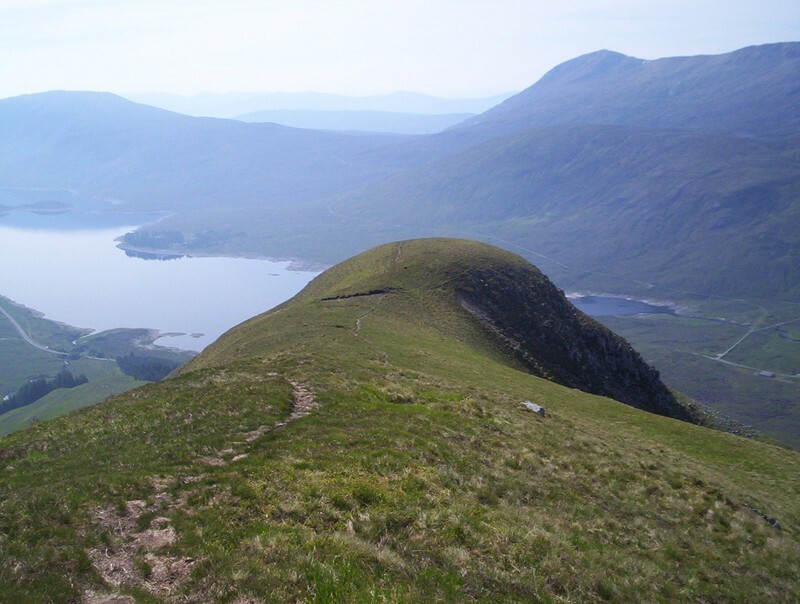 Whilst road walking is a necessary evil at least the view here is stunning - the South Glen Shiel Ridge and Loch Cluanie. 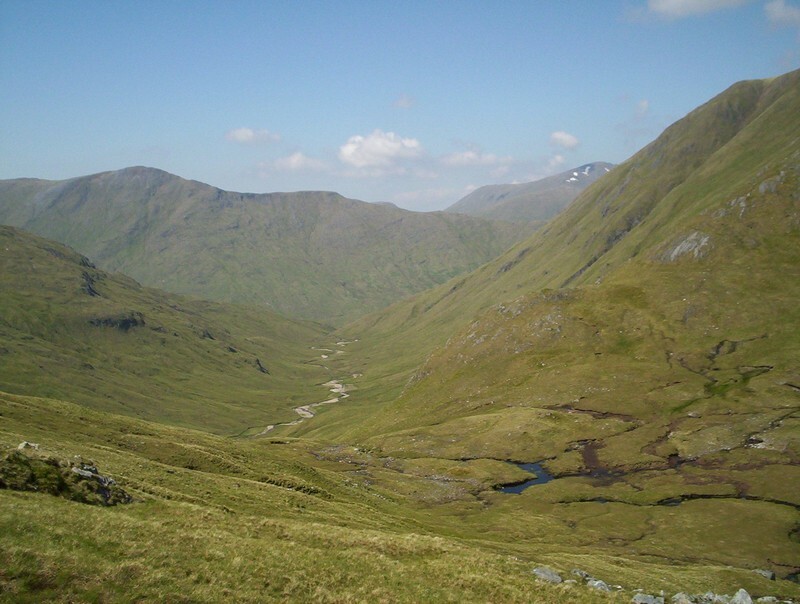 The walk starts by the east end of the small Glenshiel forest and climbs easily up the south ridge of Am Bathach. 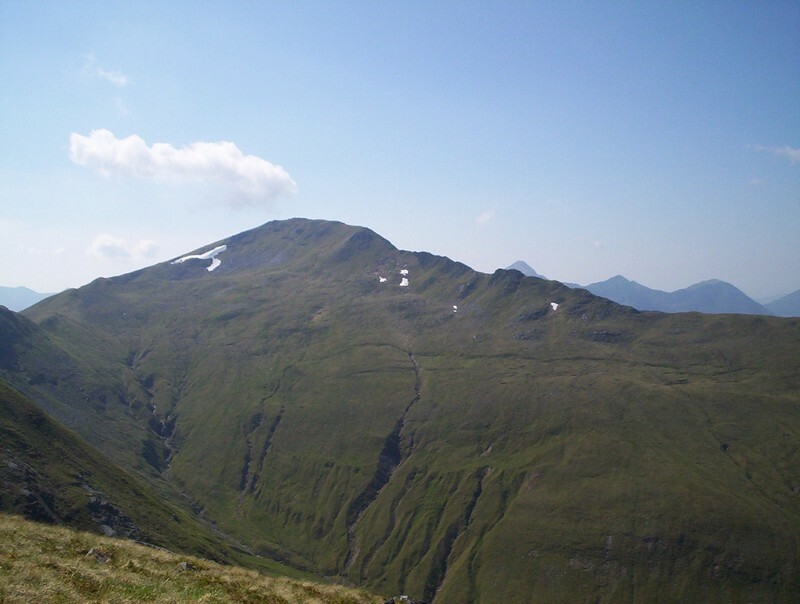 Sgurran Fhuarail and Aonach Meadhoin to the west. 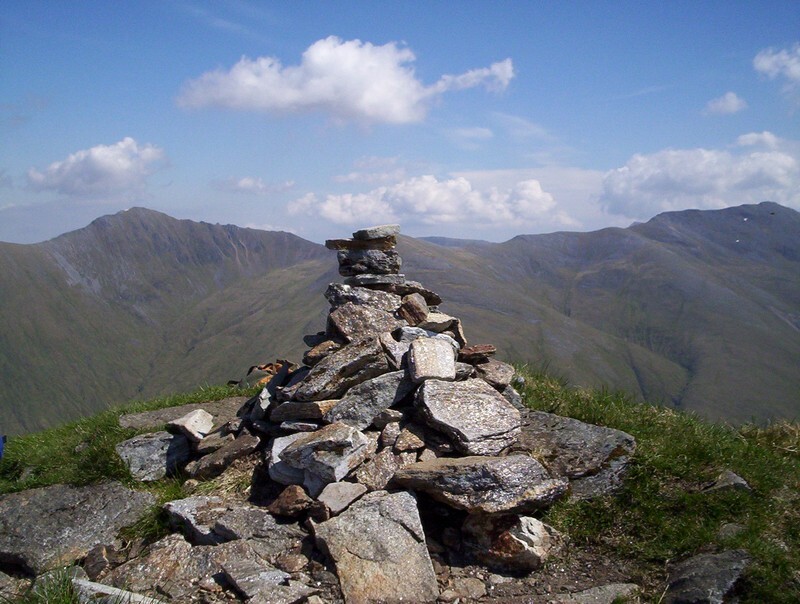 The summitsummit cairn of Am Bathach with the next target, Ciste Dhubh beyond. In the distance the hills beyond Glen Affric. 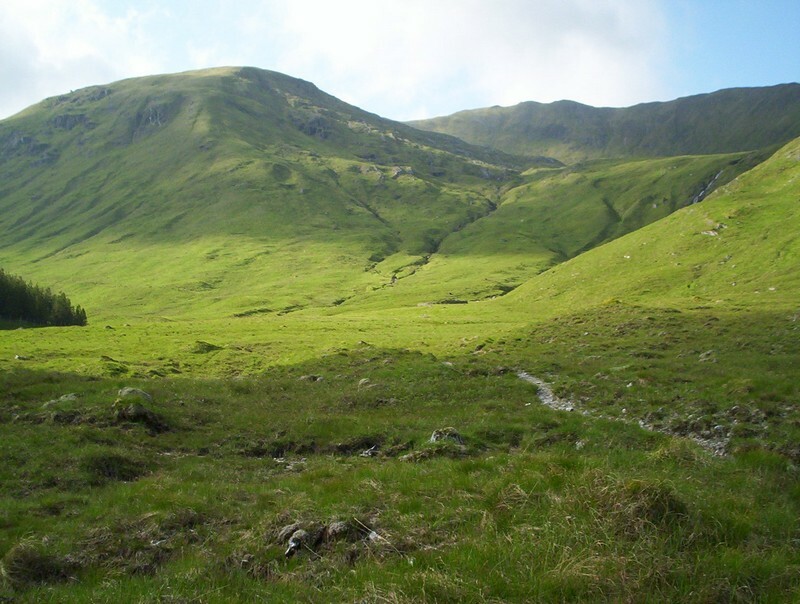 Dropping down to the Bealach a'Choinich, normally a boggy place but quite dry this June. 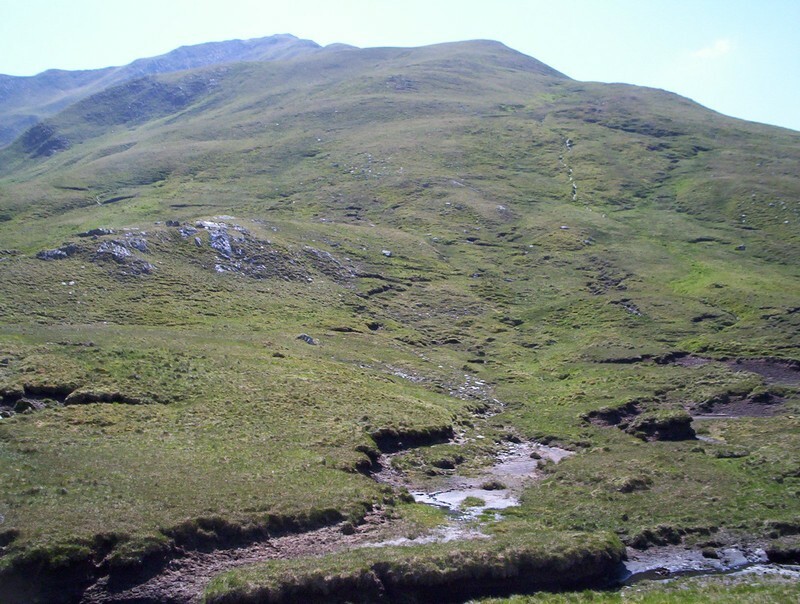 Once at the bealach there's no escaping the fact that it's a long hard slog up the initial slopes of Ciste Dhubh up to the 750m contour where the gradient eases. Here the mountain begins to reveal its interesting shape. For the adventurous there's a path right over the crest of that outcrop. 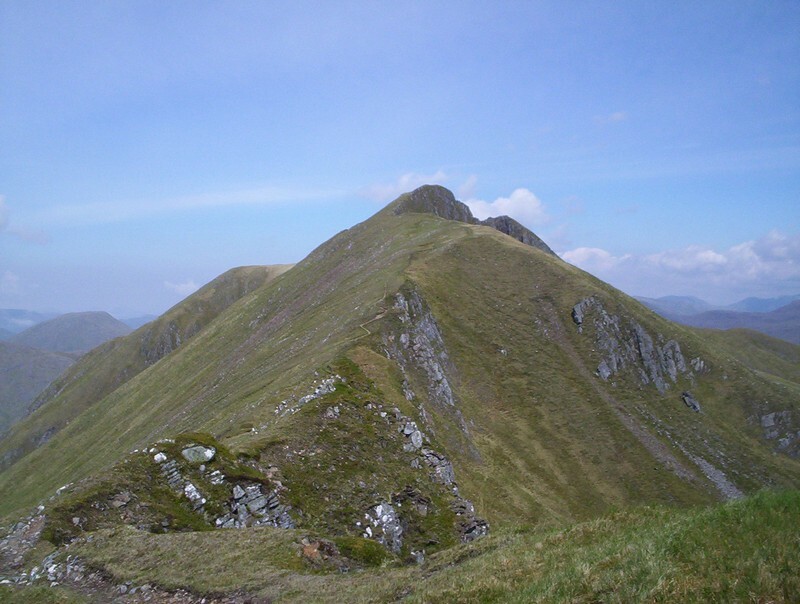 The photo shows the view looking back over this sharp ridge - almost an arete in fact. 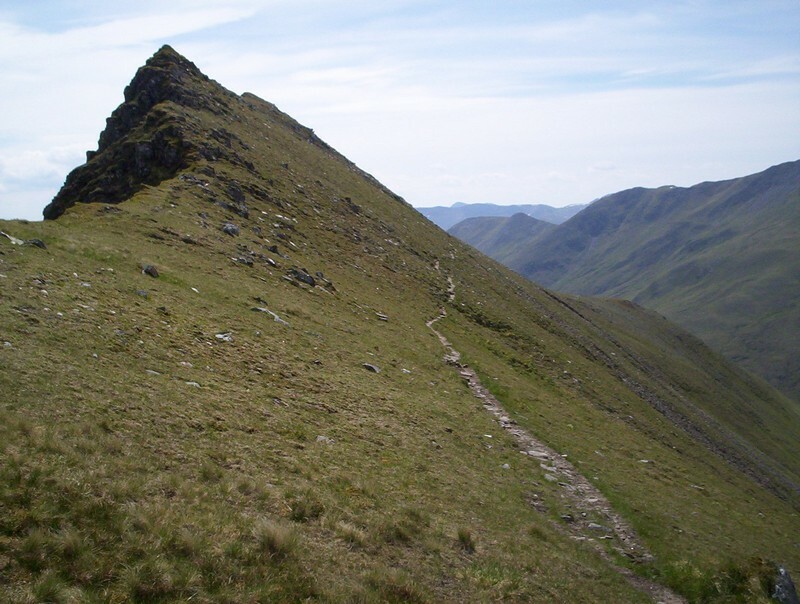 There's a big drop to the right but the path is safe enough. 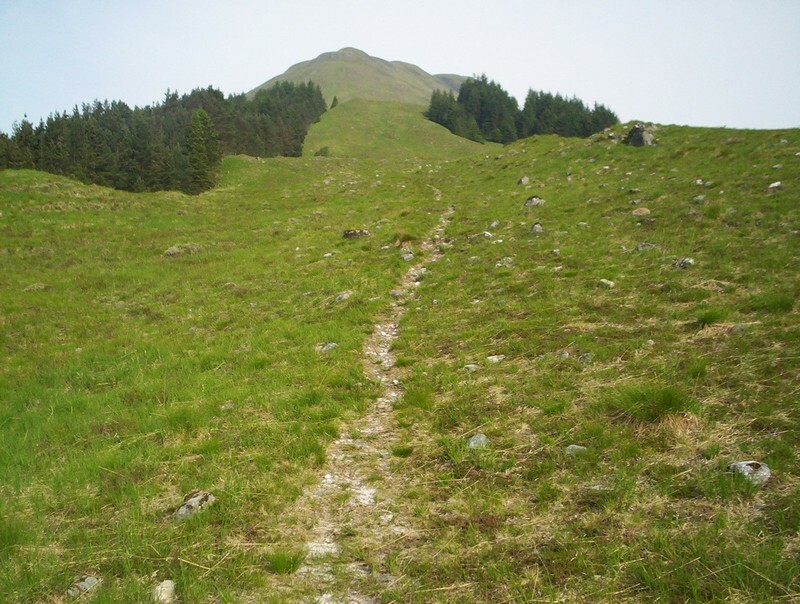 There is also a bypass path just to the left on the grassy slopes for those who can do without the excitement! 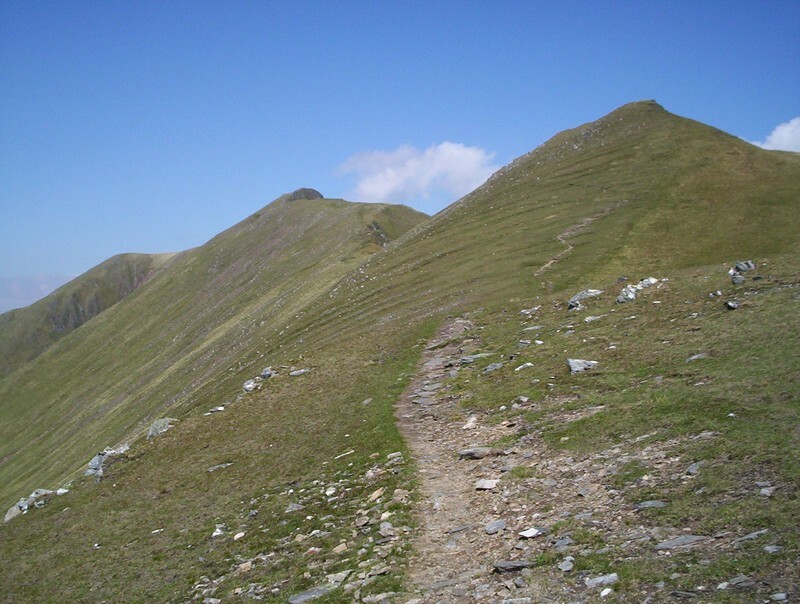 The path dips down slightly before starting the final ascent. 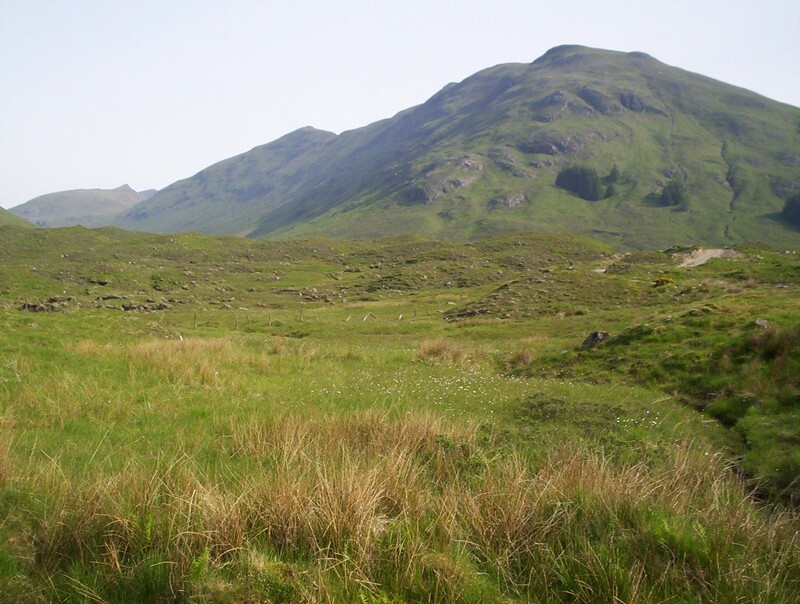 .....with stunning views of the pinnacles on Mullach Fraoch-choire to the left and A'Chraalaig to the right. 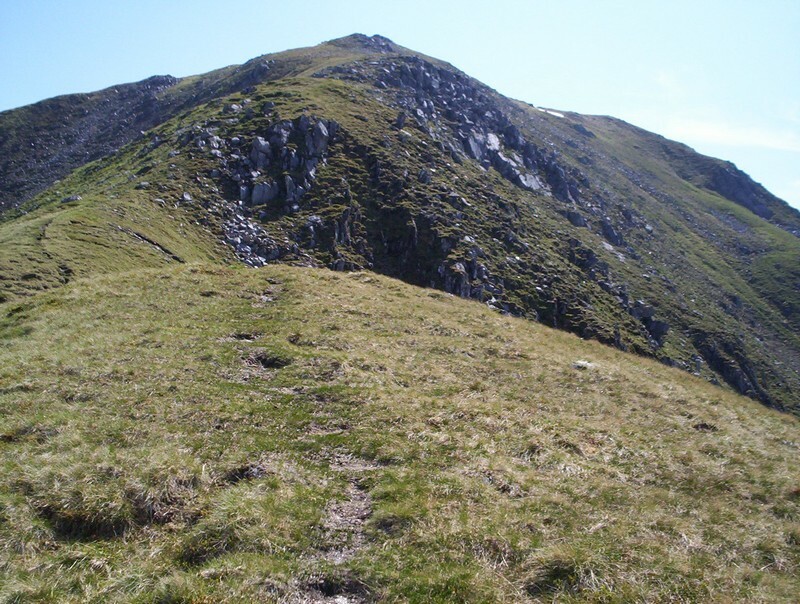 After crossing the trackless bealac the climb up to Sgurr an Fhuarail begins. 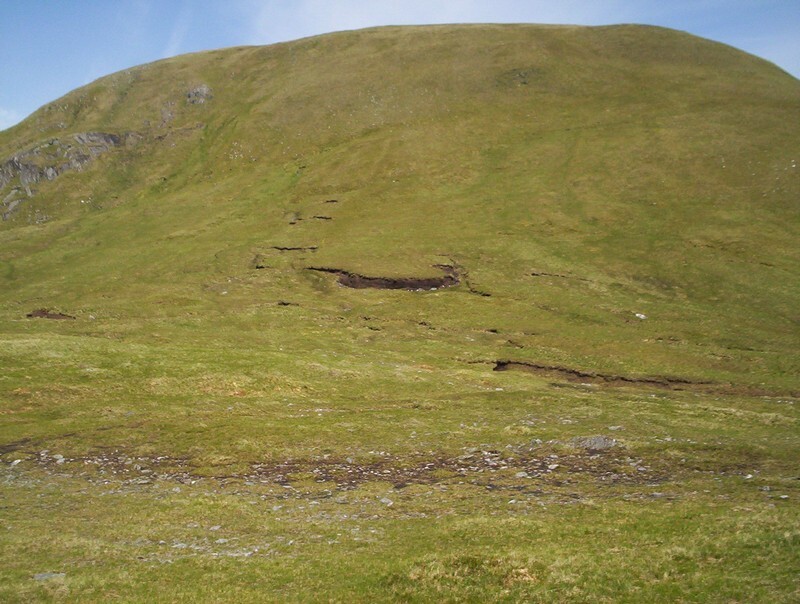 I could find no trace of a track until well up the north east ridge. It was a long hot slog up with several stops necessary for liquid. 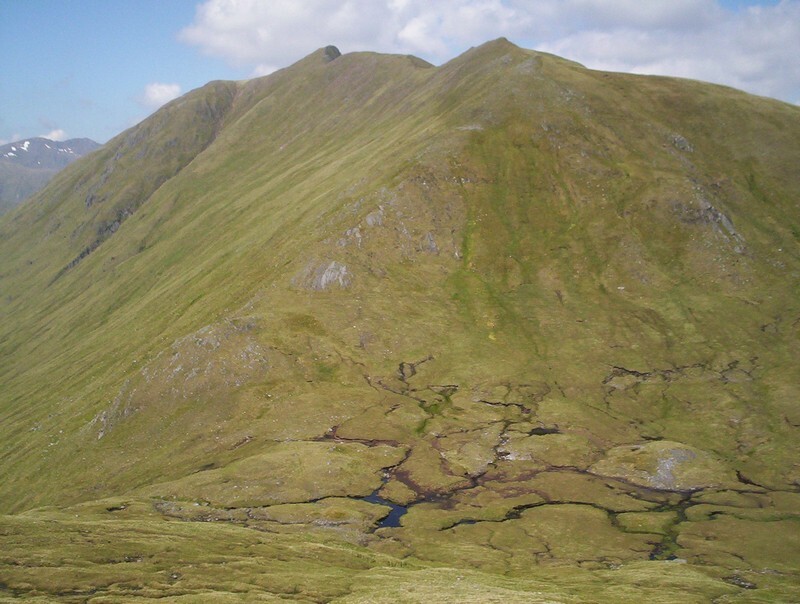 Looking back to Ciste Dhubh from the slopes of Sgurr an Fhuarail. 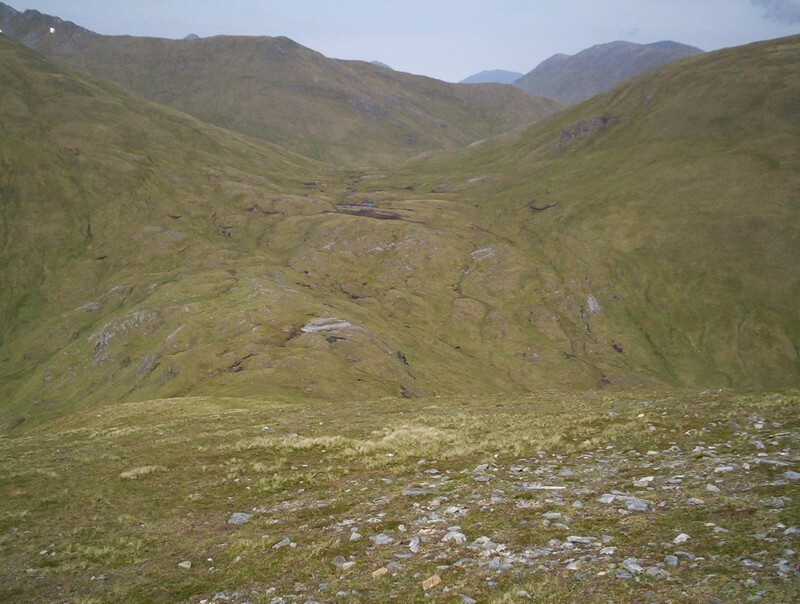 To the north lies Coire an Fhuarail with the Allt Cam-Ban stream running down to Glen Affric. 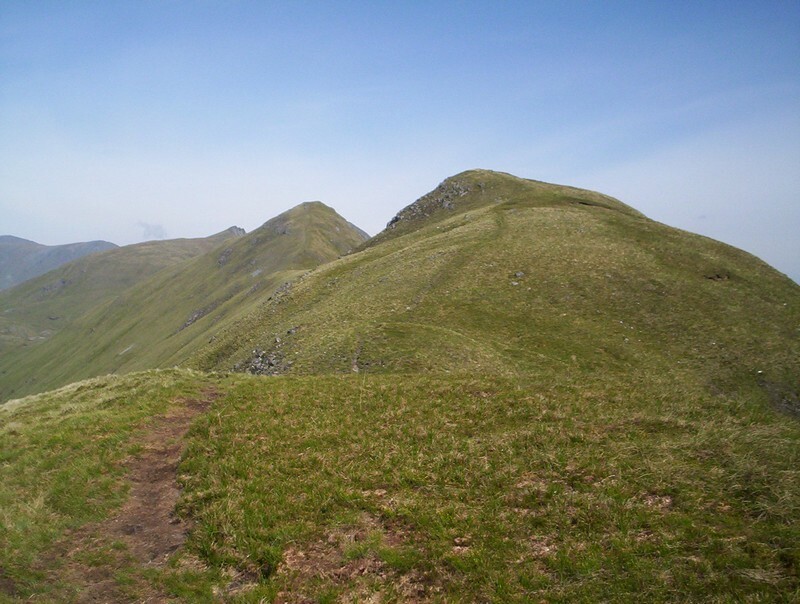 Across the coirie was Sgurr a Bhealaich Dheirg. By now I'd realised that there was no realistic possibility of me reaching this or Saileag. A climb for another day perhaps? 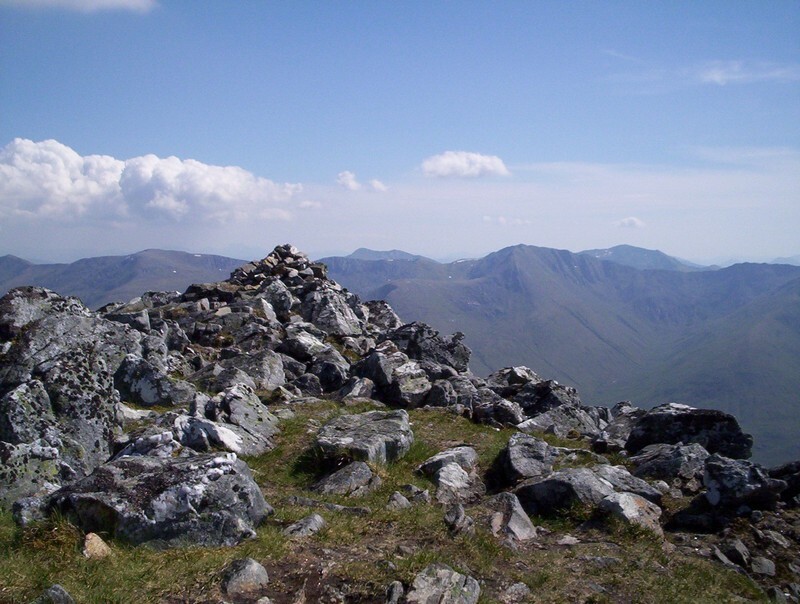 After a climb of 430m from the bealach I reached the summit of Sgurr an Fhuarail. 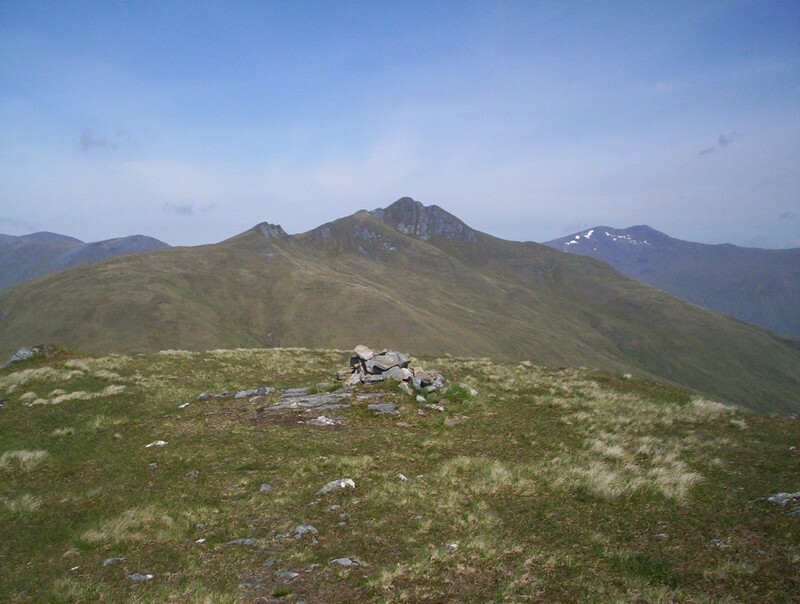 The inspiring backdrop is the South Glen Shiel ridge. 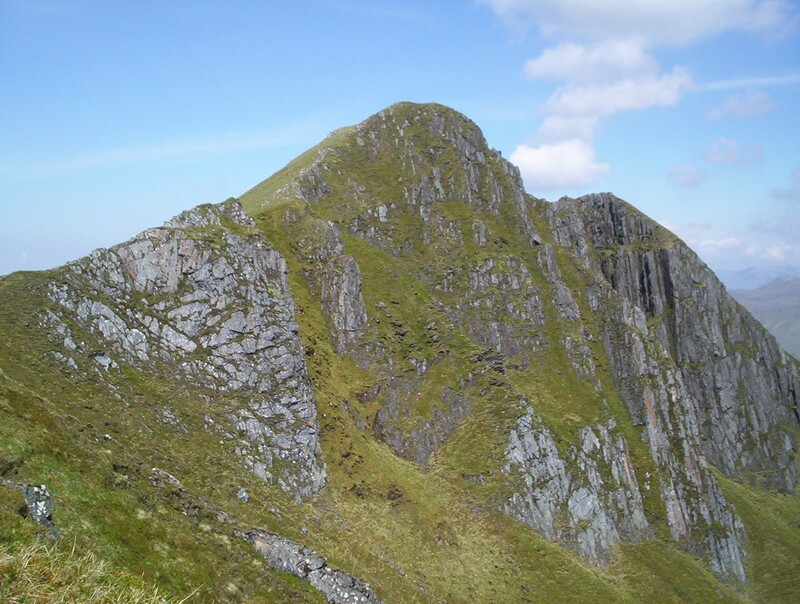 I must say that it's a pity Sgurr an Fhuarail isn't a Munro. 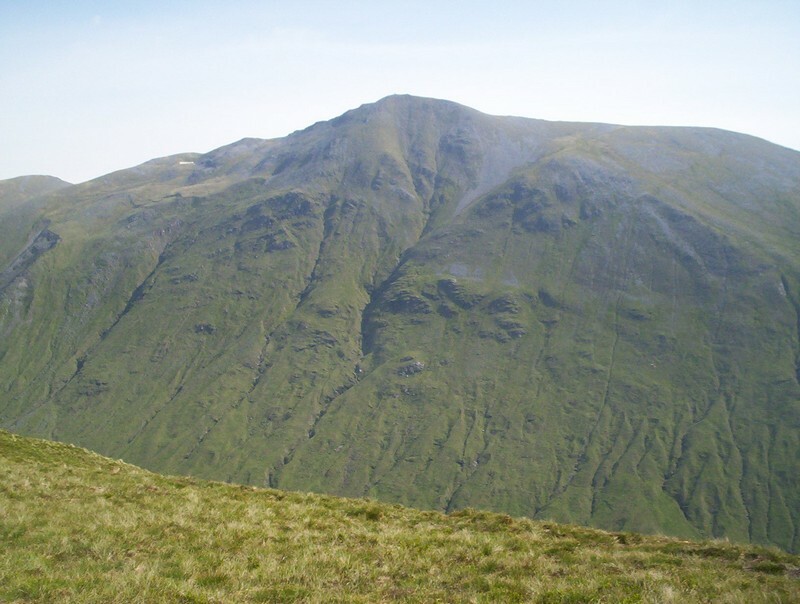 Although the drop down to the ridge is only a matter of 70m it certain feels like a separate mountain to its slightly bigger neighbour, Aonach Meadhoin. 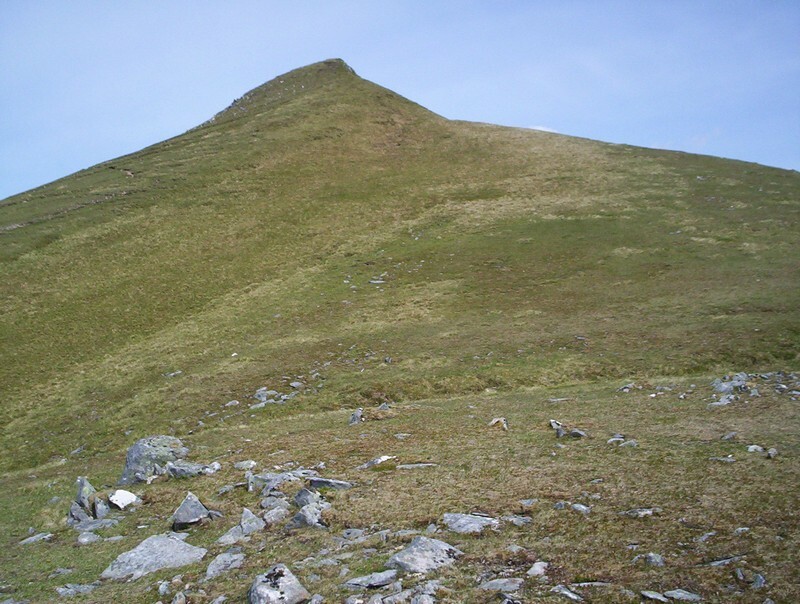 In this photo I've reached the ridge and am about to ascend the 85 metres to the summit. 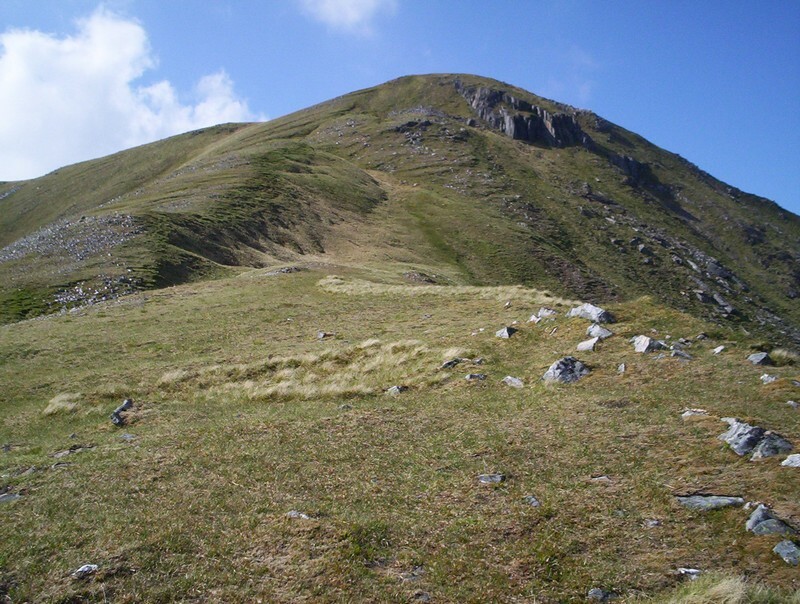 The grassy summit dome of Aonach Meadhoin is a bit of a contrast to the other two Munros on this walk. By now it was 16.30 and time to descend to the valley if I wanted a meal. It's a drop of nearly 770m to the road down rough, largely grassy slopes. Once again I could find no sign of a track so I headed straight down towards the circular stone sheep pen that could be seen near the forest. Looking back at Aonach Meadhoin it's clear that the safe way off the hill is by trending slightly west from the summit at first to avoid the cliffs. 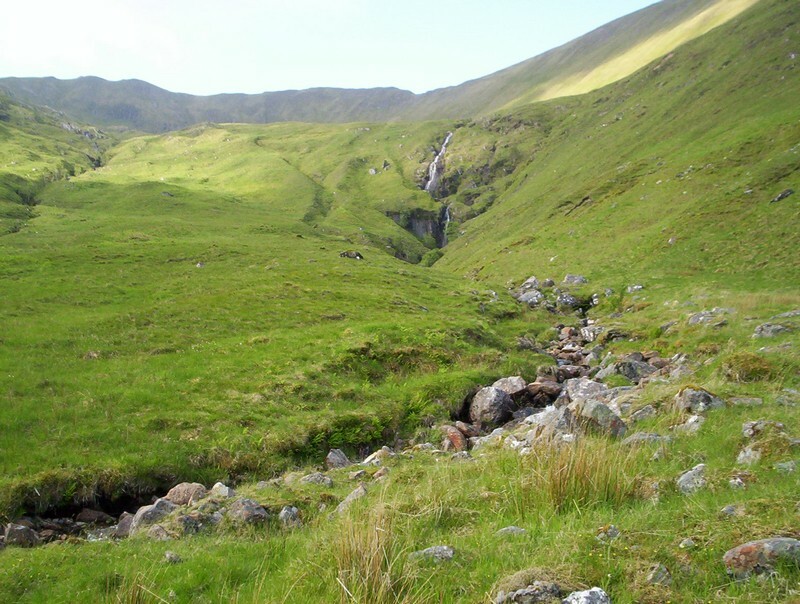 The Steall Bhan waterfall enlivens the end of the walk. 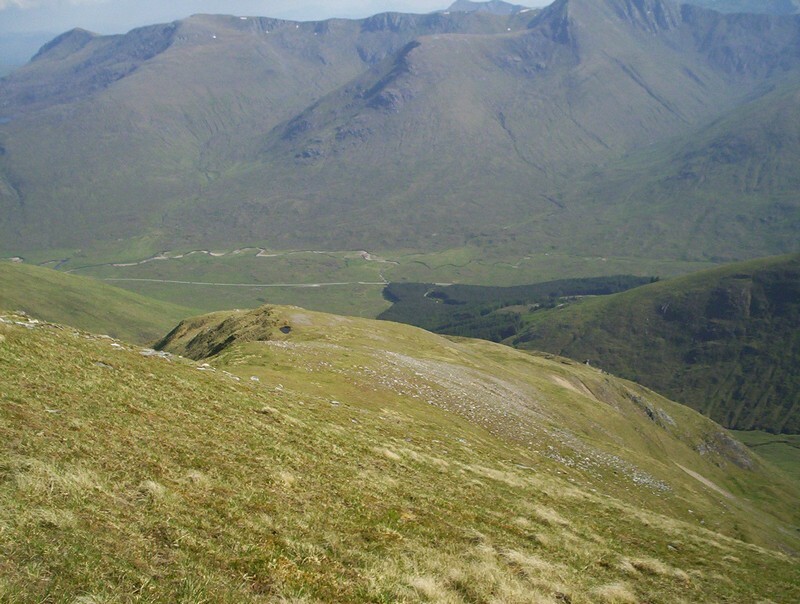 A final look back uphill towards Aonach Meadhoin and Sgurr an Fhuarail beyond on the right above the Coire na Cadha.